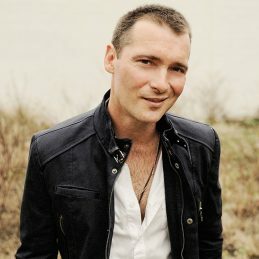 Adam Brand has three Platinum and five Gold albums to his name, along with two Gold DVD certifications and a massive twelve Golden Guitars – including double-ups for Male Artist of the Year and APRA Song of the Year. Not to mention multiple Mo Awards and four ARIA nominations for Best Country Album. In 2014, Brand will add yet another landmark album to his catalogue with tenth studio offering, My Side of the Street. A deeply soulful joint, My Side of the Street is sure to add further lustre to Adam Brand’s already brilliant output. Opener and title track ‘My Side Of The Street’ sets out a template for the twelve tunes to follow, showcasing Adam’s heartworn vocal chops alongside crisp guitars, Gospel-inspired backing vocals, and keys laden with Hammond organ effects. There are funkier numbers, from second track, ‘Doing It’ to the zesty synth, kettledrum and brass colours of ‘Girls These Days’, along with pop-rock cuts such as ‘Right on the Money’, and the laidback ‘Under the Sun’. Classic rock also gets more than a passing nod with the pulsing ‘Stupid What You Do’, and the driving keys, lead and licks of ‘Put Em On Me’. In true Adam Brand style, there are songs of love, heartbreak and redemption, from ‘What Your Love Looks Like’, to slow ballad ‘One Can Be A Lot’ to the plucked violins and orchestral strings of ninth track, ‘The Hearts I Leave Behind’. Through it all, the sounds of the Gospel-soul tradition abound. Duet ‘Quit This Time’ features Jasmine Rae, and is a slow-burning meditation on the pleasure and pain of all-consuming love, while ‘Bet Your Mama’ combines classic soul flavours with a smouldering vocal delivery. Closing with a well-chosen cover of Billy Thorpe & The Aztecs’ signature hit ‘Most People I Know (Think That I’m Crazy)’, Adam Brand proves once again that he’s not afraid to look back while surging forward. Brand assembled a formidable backing band in the making of My Side of the Street, including drummer Pete Drummond (Glenn Shorrock, Dead Ringer Band), bassist Matt Cornell (Richard Clapton, Shannon Noll), guitarist Chris Kamzelas (Jessica Mauboy, Jimmy Barnes), and keyboardist Brendan St Ledger (Wendy Matthews). There’s no doubt Adam Brand will covert the thirteen gems he has assembled on My Side of the Street to yet more gold and platinum – not to mention that most precious commodity of all, the continued love and respect of fans and peers, both old and new.